Today we have MORE great fun at the Everything Easter Egg-stravaganza – First I want to tell you about an Egg-citing LIVE event to be held right here at www.247moms.com. On April 6th from 1:00-3:00PT we will host a LIVE web Easter Egg-stravaganza giveaway – 2 hours of giveaways, Easter ideas and Mom conversation. Mark your MOM calenders and join us for two hours of Egg-citing fun. Now for today’s Everything Easter Egg-stravaganza – where you will find an Egg-citing family fun idea, another GREAT giveaway and even an Egg-stra yummy Easter treat to bake. Over 10 years ago I came across a new family tradition called “Resurrection Eggs”. You can either purchase this or create your own. I happened to purchase mine which came complete with 12 eggs filled with various items to assist me in telling the Eater story to my Children along with a booklet that had the story broken down to go with each egg. We have used this fun tradition to share the Easter story with our children each year. 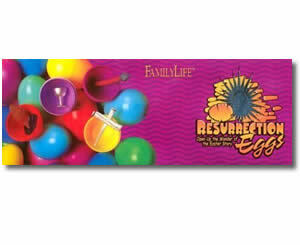 There are several ways to use these Resurrection eggs. 1. Daily countdown – Open and egg each day telling a portion of the Easter Story. 2. Tell the entire story at once opening each egg at the appropriate time in the story. 3. Host a Easter Party for friends, neighbors and family and share the Easter story with the children using the Resurrection eggs. If you are interested in purchasing your Resurrection eggs I found a great deal at Christianbook.com they are on sale for $6.99. I also Posted below directions for you and your kids to create your own set of “Resurrection Eggs”. Many of you have seen the plastic Resurrection Eggs that are used to tell the story of the Christian Easter celebration. Did you know that these can easily, and frugally, be made at home? First, purchase 12 plastic Easter eggs, the kind that you can open and fill. I recommend the size that can fit in a Styrofoam or cardboard egg carton. You can reuse one that you bring home eggs in from the grocery. This makes for easy storage so that you can use these many times without losing any of the bits and pieces. If possible, try and have each of the 12 eggs a different color. This makes it easier as well. If having 12 different colors isn’t an option, use a permanent marker to write the number 1 through 12 on each egg and then put them in the egg carton. Into each egg place the item and scripture reference written on a small piece of paper. Message — Jesus rode into Jerusalem on a donkey. The people waved palm branches. Message — Mary poured expensive perfume on Jesus’ feet. Message — Jesus shared the Last Supper with His disciples. Message — Judas betrayed Jesus for 30 pieces of silver. Message — Jesus carried His own cross. Item – toothpicks or Popsicle stick cut and glued in a cross form; or, a small plastic cross from a Christmas ornament or necklace. Message — Soldiers placed a crown of thorns on Jesus’ head. Item — Small thorny branch, or a large thorn all by itself. Message — Soldiers parted Jesus’ garments and cast lots for His coat. Item — Swatch of burlap and a nail. I’ve also seen miniature dice used for this one. Message — Jesus was nailed to a cross and pierced in His side. Message — They gave Jesus vinegar mixed with gall on a sponge to drink. Message — Spices to prepare Jesus for burial. Message — The stone covering Jesus’ tomb was rolled away. Message — The napkin around Jesus’ head was lying separately from His linen clothers. He was not there. He has risen! Note: I have seen these done slightly different, or using slightly different items. If you have to substitute and use different items, that’s OK. The point is to get the story across from the point that Jesus rides into Jerusalem riding on a donkey (now celebrated as Palm Sunday) to when it is discovered that is no longer in his tomb but has Risen (Easter Sunday, also known as Resurrection Day). Who doesn’t love music? Cd’s are great for all ages. My youngest boys enjoy listening to both music and stories on CD where my teenagers prefer to take their Cd’s and load them to their IPods. Placing CD’s in my kids Easter baskets is one of my favorite ideas as I can also get some great deals on CD’s ( see today’s Name Your Tune deal below) at a variety of places from Amazon.com, half.com, ebay.com or watch for sales at my local stores. Name Your Tune is an exciting new Children’s music compilation that is made-to-order and personalized for each child. Children will hear their name more than 80 times throughout 14 much-loved songs. A great way to enjoy music, have fun, and learn together! Listen below to these fun kid engaging songs. My kids have always loved hearing their names personalized in music and books so I know that these Name Your Tune CD’s will be a FAVORITE with your kids. Name Your Tune is offering our 24/7 MOMS a special BOGO deal ( Buy one get one FREE) That’s right buy one and you get one FREE – This is an AMAZING deal if you ask me. To get this great Deal use the code 247moms at check out. Coupon code expires April 7th, 2009 at midnight. Click here to order your CD’s today. Boom Boom, Ain’t It Great To Be YOU! Makes: 2 doz. or 24 servings. HEAT oven to 350°F. Line 13×9-inch pan with foil, with ends of foil extending over sides. Grease foil; set aside. Microwave chocolate and butter in large microwaveable bowl on HIGH 2 min. or until butter is melted. Stir until chocolate is completely melted. Add sugar; mix well. Blend in eggs and vanilla. Stir in flour and nuts until well blended; spread into prepared pan. BAKE 30 to 35 min. or until toothpick inserted in center comes out with fudgy crumbs. (Do not overbake.) Cool completely. USE foil handles to lift brownies from pan. Cut into egg shapes with 3-inch oval cookie cutter. Decorate with decorating gels and candies to resemble Easter eggs. Use Your Stove and Place chocolate and butter in medium saucepan; cook on very low heat until chocolate and butter are melted, stirring constantly. Remove from heat. Continue as directed. Substitute 13×9-inch glass baking dish for the baking pan. Prepare brownies and bake as directed, reducing oven temperature to 325°F. I began using the Resurrection eggs with my children a few years ago. It is now a family tradition for us. It’s a great way to celebrate the holiday and teach kids the true meaning of Easter all at once. I love the resurrection eggs idea! I’ll have to start this with my kiddos!